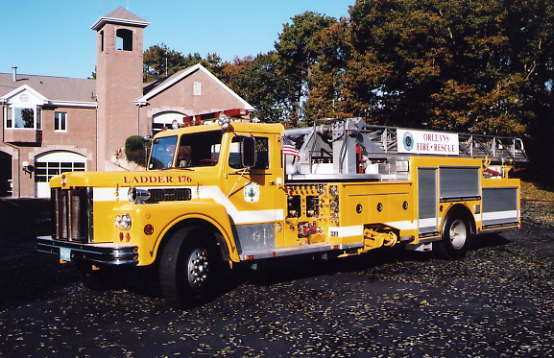 with a midship 75' tower, 1500 gpm pump, and 300 gallon tank. Looking at 2007-2008 delivery if approved. 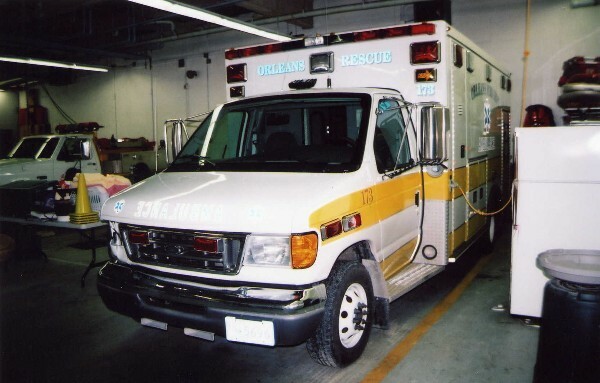 Replaces the 2000 Ford / Road Rescue destroyed in the March 2005 MVC. 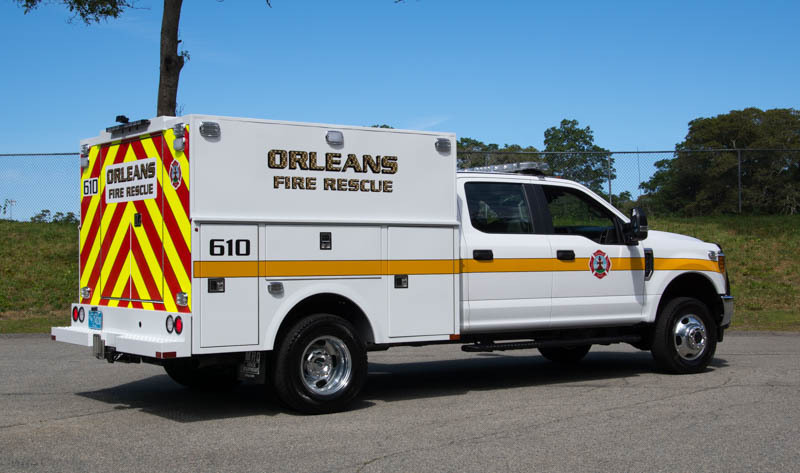 Orleans recently completed this forestry truck. 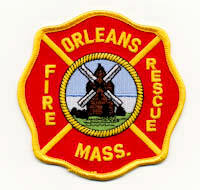 utilizes the Orleans in-house made 25 gpm / 225 gallon pump and tank. 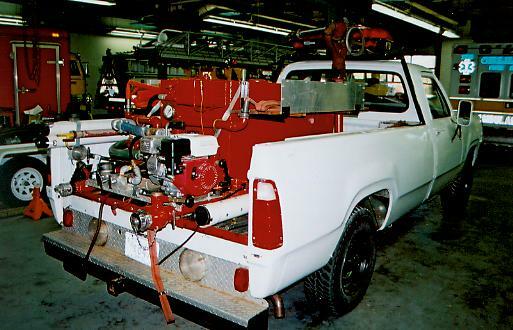 The unit carried a variety of tools and even has a small deckgun from an old engine. 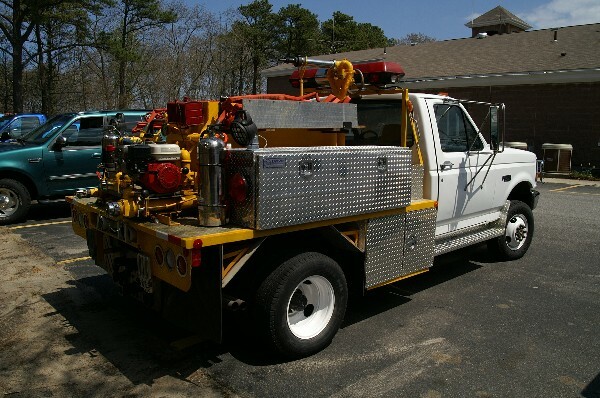 several fire engines with Jaws of Life tools, and the Hyannis Fire Dept. approximately 2 hours during the rescue. Prayers are with all involved. out of service with damage it received when it struck a deer on the exit ramp. 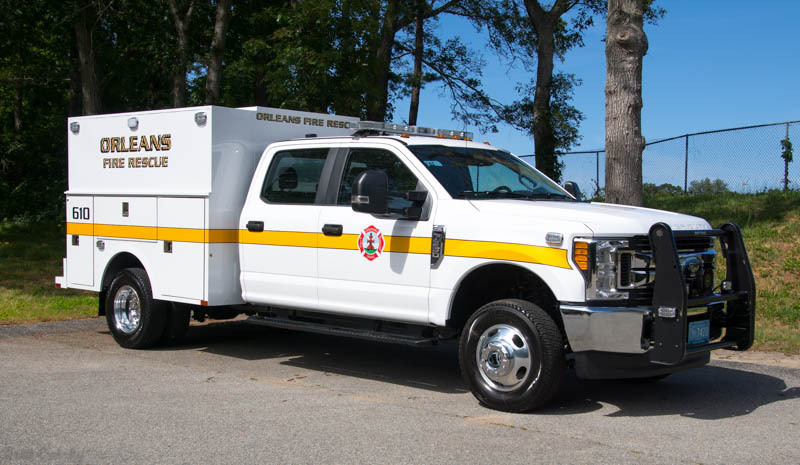 The new Orleans Rescue 173 went in service in January 2005.
replaced the 1996 International / Road Rescue Type I rescue. 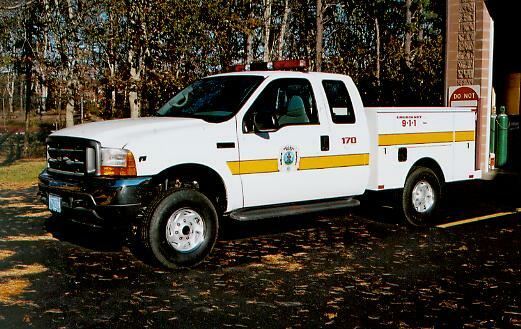 The new Rescue 173 was damaged in Feb 2005 when it struck a deer. The right headlight and quarter panel was damaged. 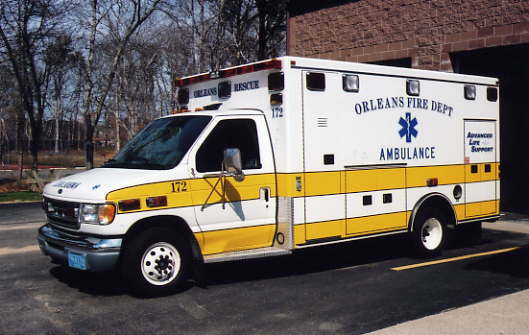 Orleans put a new 2003 Ford E450 / Road Rescue Type III Ambulance in Service. AFFF Foam System, Holmatro Jaws. 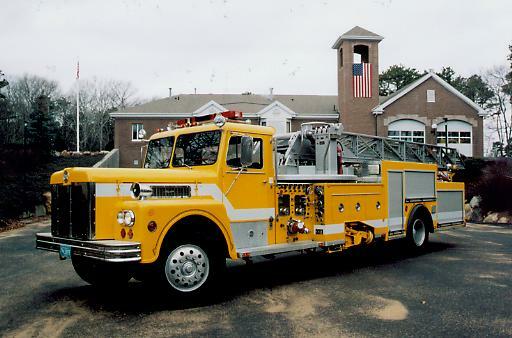 Replacing a 1982 Ford/Pierce 1000/500 Pumper. 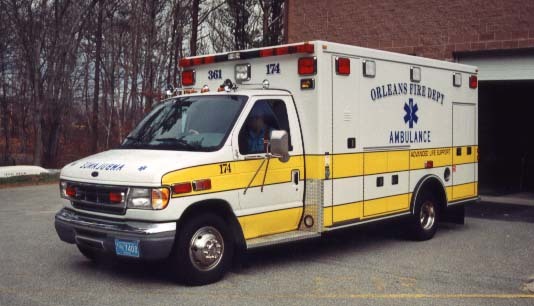 The new Orleans ambulance R-174 is a 2000 Ford E450 / Road Rescue Type III Ambulance. 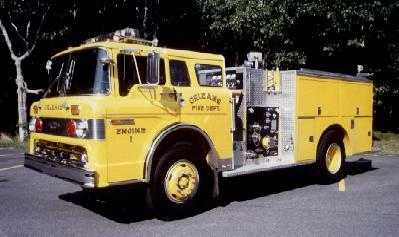 It has the Orleans colors of white with two yellow stripes. 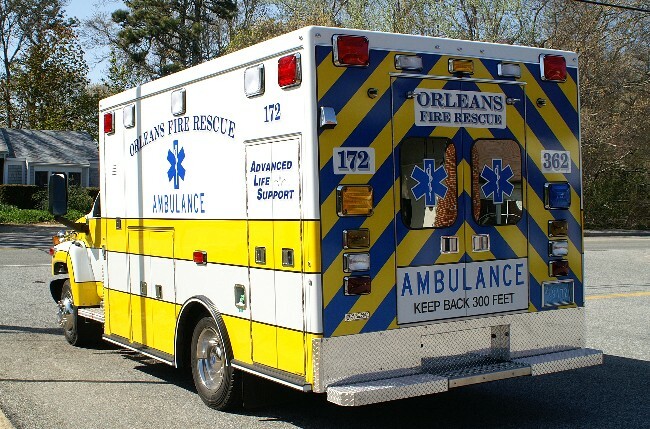 This is a 3rd ambulance for the town of Orleans. 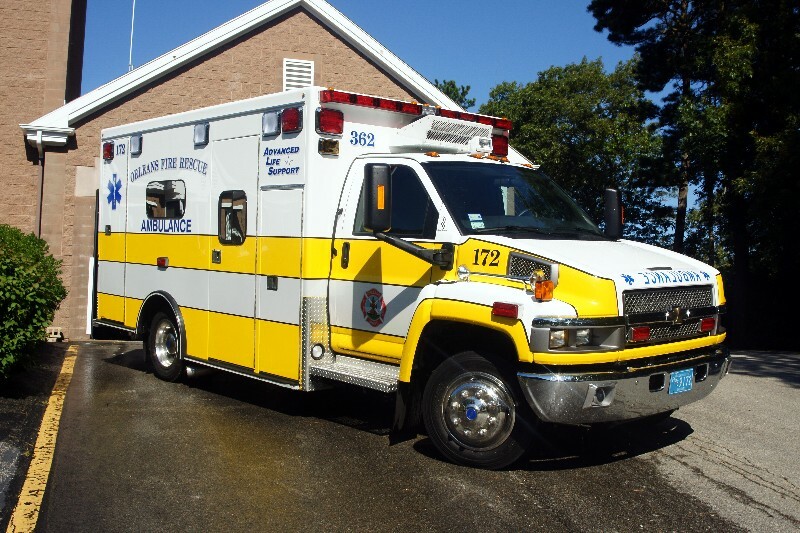 Rescue 172 (1993 International /Road Rescue) will become reserve and Rescue 173 (1996 International / Road Rescue) will run 2nd due. 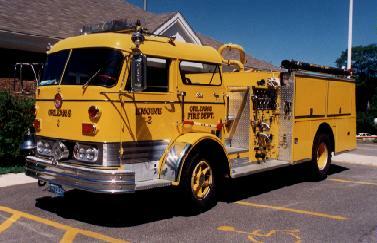 The 1982 Ford F8000 / Pierce pumper Engine 175 (all yellow) was retired upon arrival of the new 2001 KME. 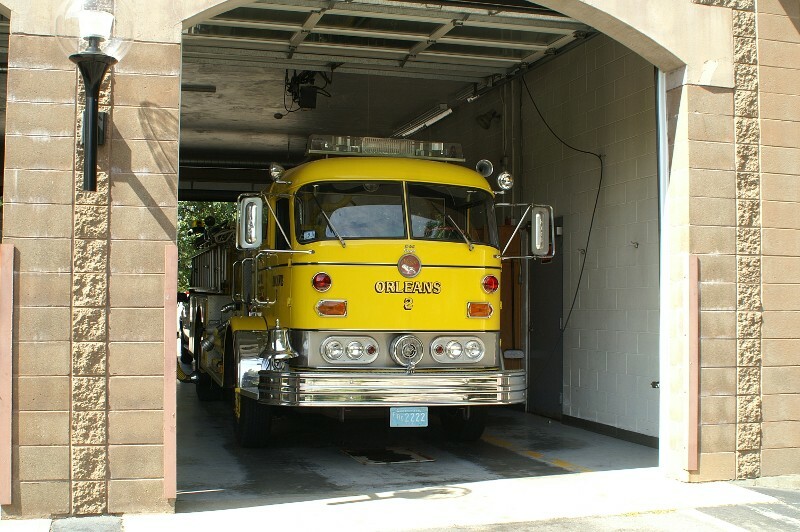 The older 1966 Mack C95 pumper, which was Engine 174, has been reassigned as Engine 178. It will stay in reserve. 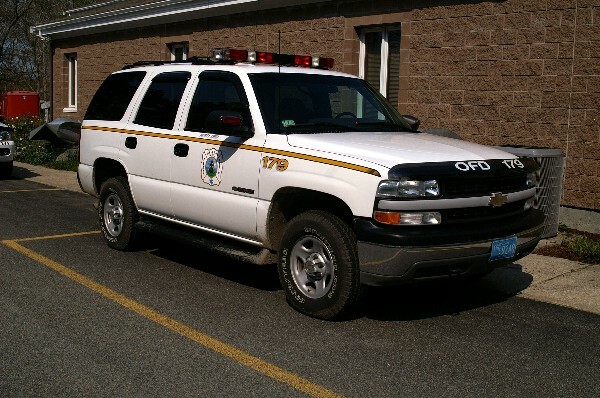 Orleans has also aquired a surplus military 1978 Dodge Power wagon 4x4 pickup truck. 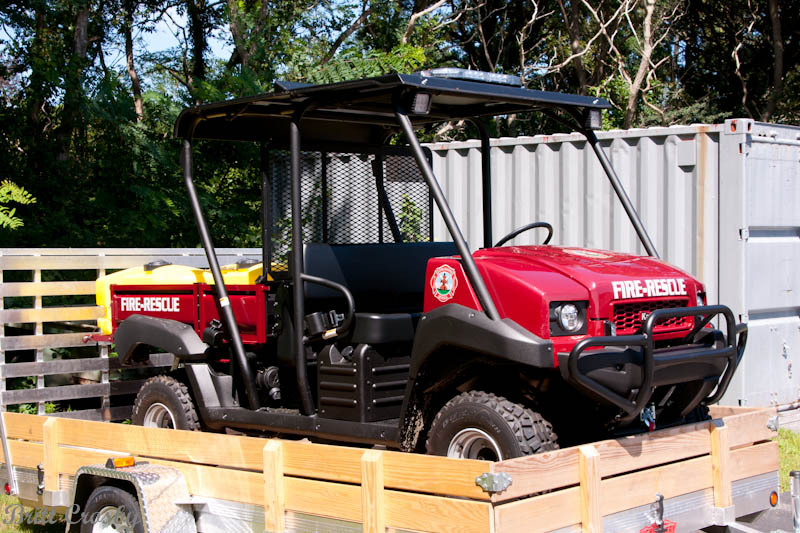 It has been under construction as a forestry vehicle since 2000 and is nearing completion Nov 2001. 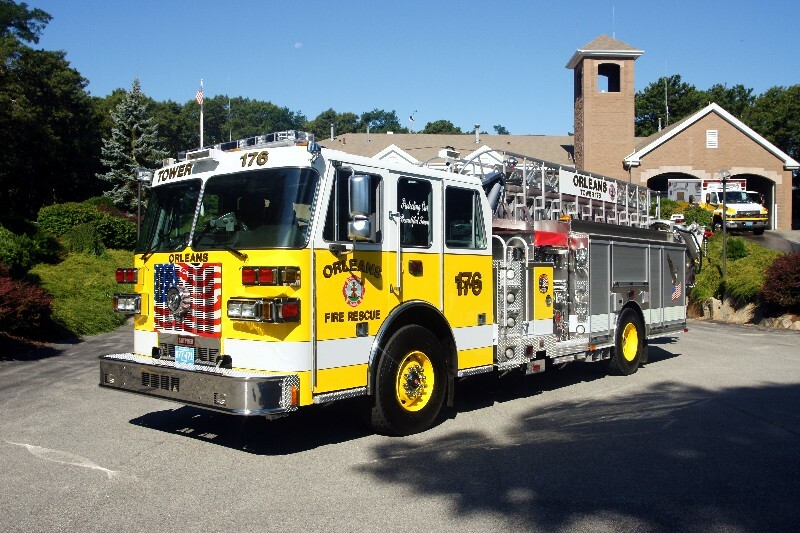 It has a 50 gpm pump and 225 gallons of water. 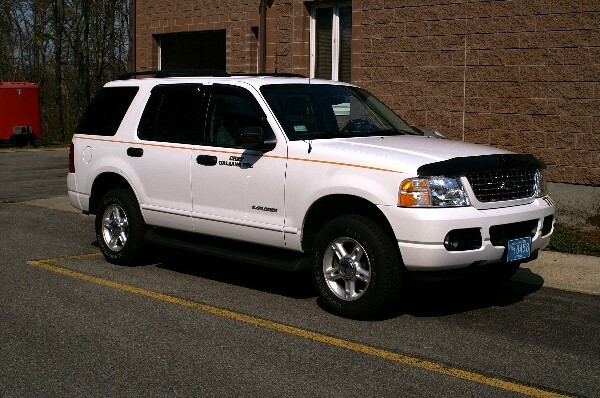 It is painted white, but is expected to ultimately have a yellow stripe. 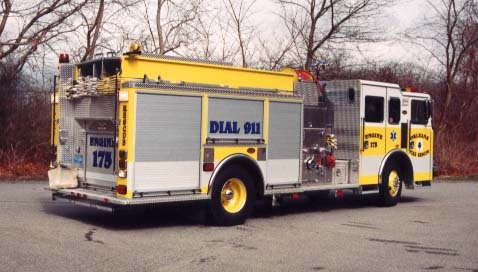 One unique feature is a mounted deckgun with a small diameter tip. 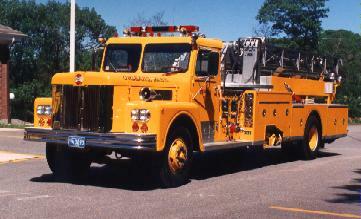 Orleans Ladder 176 - 1974 Maxim 85' aerial - is currently being refurbished. 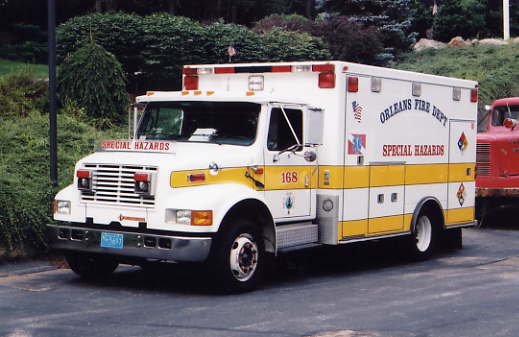 Oct 2001. 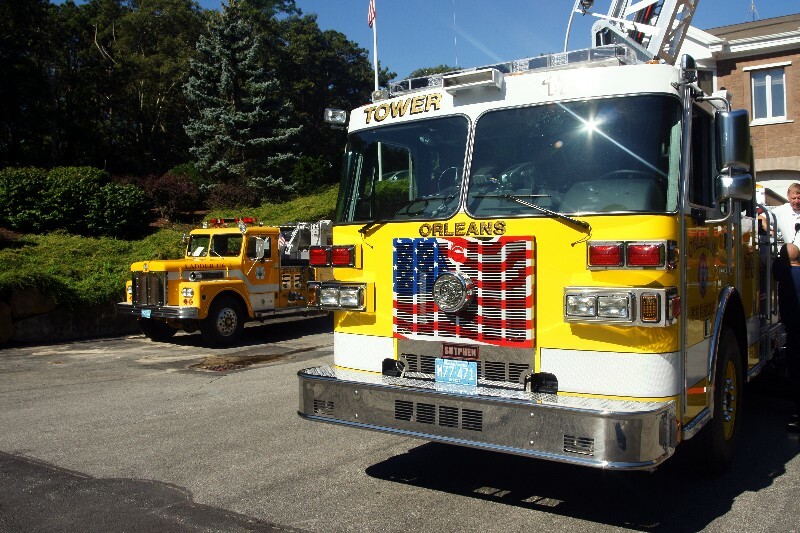 Orleans Ladder 176 returned from its rehab and is being re-outfitted for service as of Nov 9, 2001. 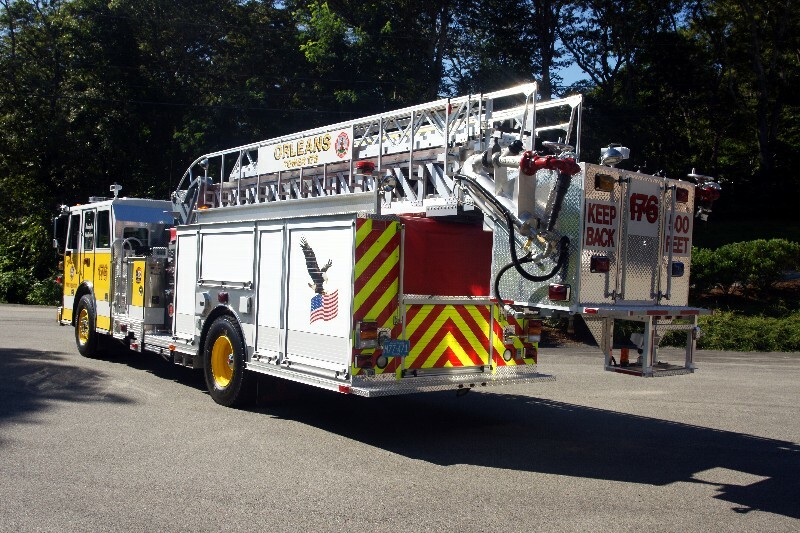 The aerial has been rebuilt, a new body with rollup cabinets installed, and a white stripe has been added for visibility. 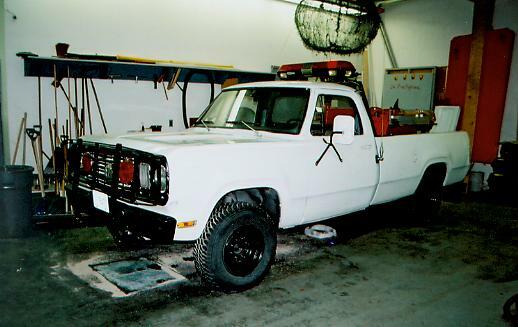 The body work was done by the area KME dealer. 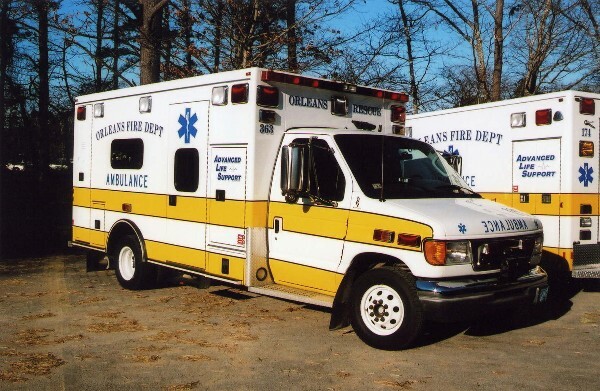 a Captain for a number of years and is a paramedic. 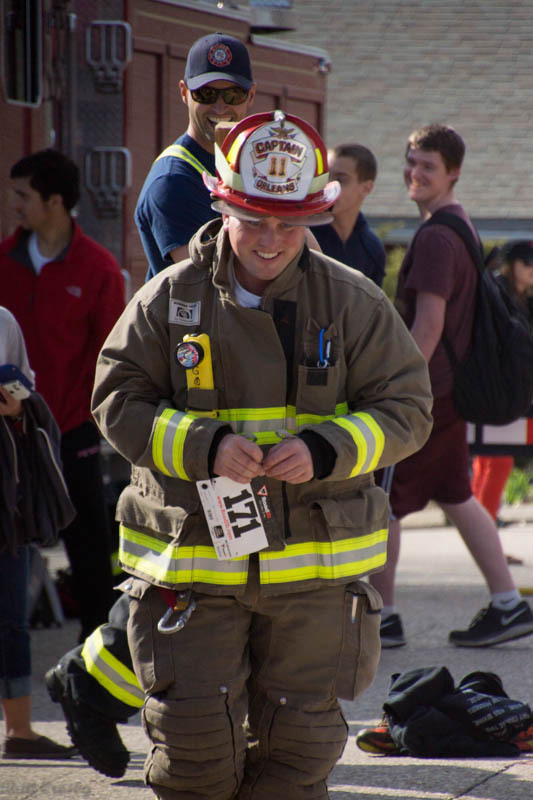 Tim Gula has been promoted to Captain replacing Deering. 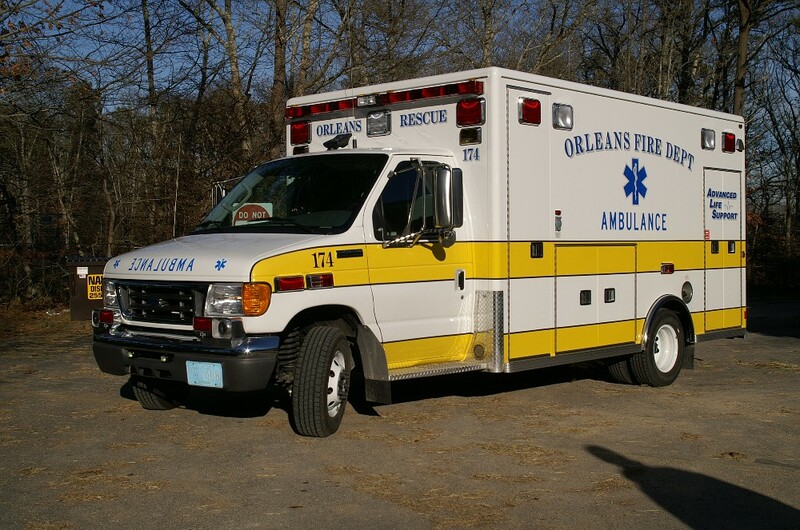 retired chief William Quinn on May 15, 2014.
time member of the Orleans FD. 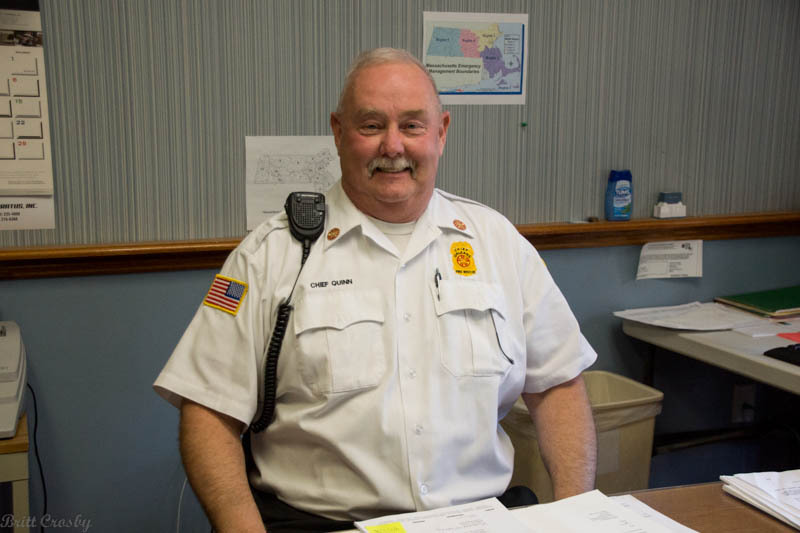 RETIRED ORLEANS FIRE CHIEF WILLIAM QUINN JR.
who retired May 15, 2014. 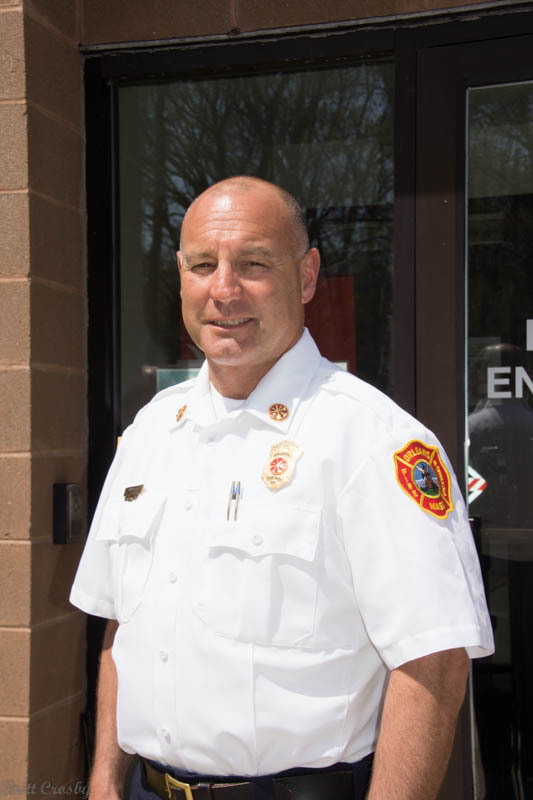 He has served as fire chief since 2008. 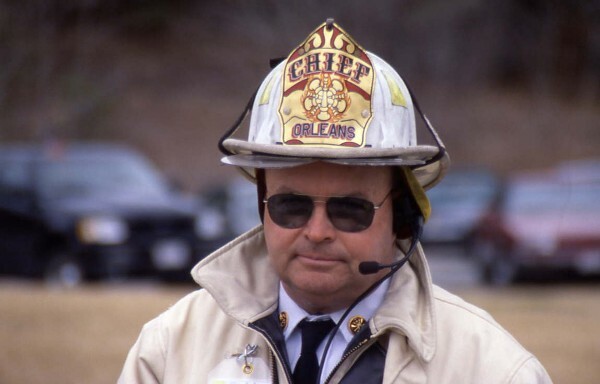 Chief Quinn is a long time member of the OFD. 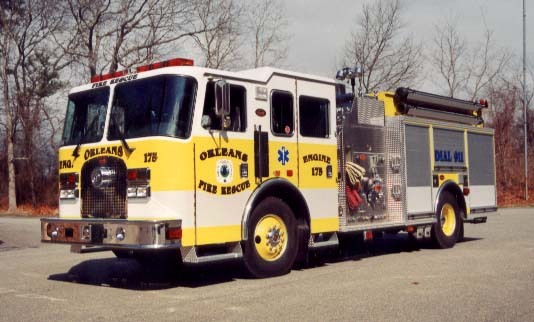 Orleans responded to 2,253 runs in 2001. This is an 18.9% increase over 2000! 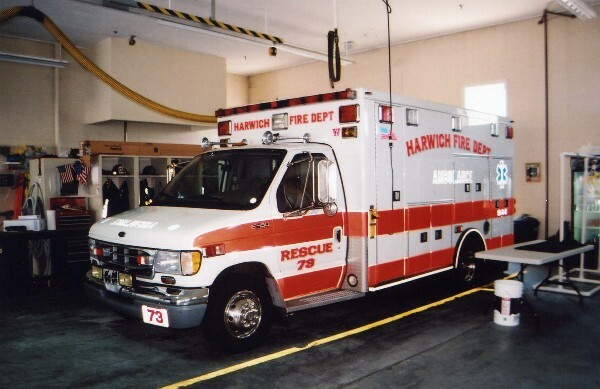 There were 358 additional calls in 2001. OFD averages 6.2 runs a day. 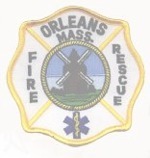 Orleans Fire Chief Steven Edwards retired in Aug 2007, with a retirement party held on March 1, 2008. 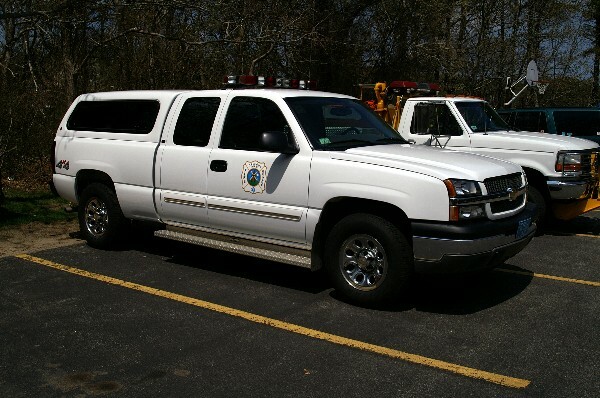 Deputy Chief William Quinn is presently serving as acting chief and Capt Anthony Pike is serving as acting Deputy. March 2008. Deputy Kenneth Mayo has retired. 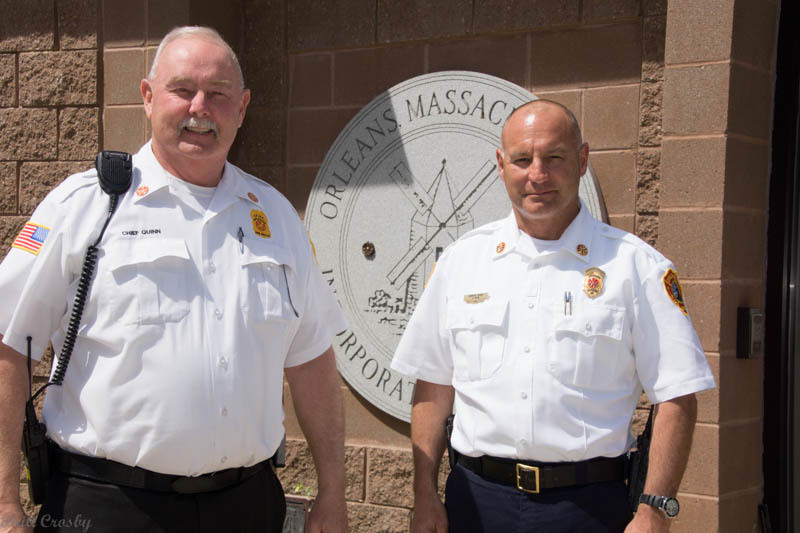 Long time Deputy Chief Stephen Edwards was promoted to Fire Chief upon the retirement last winter of long time Orleans Fire Chief Raphael Merrill. Lt Kenneth Mayo was promoted to Deputy Chief.